Despite growing evidence on their lack of efficacy and potential risks, health risk assessments (HRAs) and biometric screenings remain popular amongst employers. As advocates for combatting misinformation and promoting positive wellness experiences, Wellable is proud to release its latest podcast discussing the pitfalls with these two widely implemented wellness services. With industry expert and founder of disease management Al Lewis as the guest, the podcast will certainly not disappoint. If you offer or are thinking about offering these services, the facts and information shared in the podcast will make you think again! For those visual learners and time-constrained professionals, you’re in luck! Wellable created an infographic that summarizes the wisdoms that Al Lewis shared on the podcast. Check it out below or download a copy to share with friends and colleagues! 0:17:45: Biometric screenings as a measurement tool? Al: I gotta tell you, if you have employees who don't realize they're supposed to buckle their seatbelts, you've got bigger problems than your wellness programs. Nick: Hey everyone, and welcome to the Wellable podcast, a series focused on building better cultures and more productive workforces. Whether you're an employee wellness and engagement expert or novice, you're in the right place. I'm your host, Nick Patel, and Wellable is your one-stop shop to stay informed and up to date on trends and data in the employee wellness and engagement industry. Before we get started, be sure to connect with us and join the conversation on Twitter. Our handle is @GetWellable. Also, I’d love to hear more from you, so shoot me an email at nick (at) wellable.co to let me know what you think of our show and topics that you want us to discuss in feature episodes. We have a great episode in store for you today. This is a particularly special episode, because we have the one and only Al Lewis joining us. Al will be talking about wellness outcomes, and because he actually measures outcome validly, he has been called the Wellness Industry’s “Troublemaker In-Chief,” and that's by supporters. What his detractors say can't be repeated in a family forum such as this one. Before getting into wellness the 1990s, he was a partner at Bain & Company. He graduate Phi Beta Kappa from Harvard, where he also taught economics. Two of his wellness books have been trade best sellers, and one was named “Healthcare Book of the Year” by Forbes. His health literacy company, Quizzify, is the only employee health can be allowed to carry the Harvard Medical School shield. He is not perfect though, despite all his accomplishments, he still can't get his kids to clean up their rooms. I can spend more time walking through Al's qualifications but we need to get in to why we all here today: to learn about why HRAs and Biometric screenings are not all that they are cracked up to be. So, without further ado, I’d like to welcome Al to our show. Al, thanks for joining us. Al: Thank you very much for having me Nick. Nick: One note to our listeners before we get started. We are letting Al sprinkle a short product placement into the show like Reese's Pieces and ET. However, since this is a wellness presentation, his won't contain any sugar. Al, before we get started, can you give us the elevator pitch for Quizzify? I think it will be helpful for our listeners just to understand the foundation from your perspective on why the employee wellness industry is where it is, and why you created Quizzify to solve the problems you see. Al: At Quizzify, our model is “Wiser employees make healthier decisions,” and we've combined a trivia-jeopardy-like the trivia with educational content that has been reviewed by doctors at Harvard medical school to create a very entertaining way of learning basics and intermediate stuff about health and health care. Al: Oh, yes yes. we say that it’s jeopardy meets health benefit educations meets Comedy Central. Nick: There we go, I always like that description. So that was background. So one of the reasons why we wanted Al to join us today is that he writes a blog on employee wellness that's a must-read. There’s so much great content, but unless you are a regular follower, it's easy to miss some of the best articles and key takeaways. I think it will be helpful for our listeners to get quick crash course on two major topics you discuss often: HRAs and biometric screenings. Nick: So let's start with HRAs. For our listeners unfamiliar with this acronym, it stands for “Health Risk Assessments.” You may have also heard of it being called “Health Risk Questionnaire” or some derivative of that. In short, it's a questionnaire that employees fill out with two goals in mind: first, to provide employees with an assessment of their health risk and ways to better manage them, and second, it provides the employer with information about the risk of their employees as a group. Al, you've been a critic of HRAs as a solution. What are some of the major reasons why? Al: Well? do we have all day or just a few minutes here? Al: I'll just focus on the highlights. Number one: they're usually way out-of-date. So, I'm reading these things and they're talking all about “buckling your seatbelts.” I got to tell you, if you have employees who don't realize they're supposed to buckle their seatbelts, you've got bigger problems than your wellness program. There's probably not been an employee in the history of wellness who used to not buckle their seatbelt, then, the health risk assessment told them to buckle their seatbelts and they thought “Oh, silly me, I need to buckle my seatbelt.” Has probably never happened once out of millions of people. But, they don't tell you anything about texting while driving which is quite hazardous, actually can increase your risk to a level commensurate with with drunken driving, is illegal in many states (or most states), and yet not a word about it. So they're way out of date, and that's number one. I got to tell you, if you have employees who don't realize they're supposed to buckle their seatbelts, you've got bigger problems than your wellness program. There's probably not been an employee in the history of wellness who used to not buckle their seatbelt, then, the health risk assessment told them to buckle their seatbelts and they thought “Oh, silly me, I need to buckle my seatbelt. Issue number two is that some of the information is JUST PLAIN WRONG! I just saw this the other day, I won't mention who the vendor is… if people want to see who the vendor is, they can look on my website. But there was a… Somebody sent me (a number of people actually) sent me Outcomes Reports from this vendor based on their Health Risk Assessment. One in particular had metabolic syndrome which is pre-diabetes, and there are certain things that are associated with higher risk of diabetes and one of them is drinking skim milk instead of whole milk. Essentially, every recent study has shown that [whole milk] correlates with a much lower incidence of diabetes than skim milk does. And yet there it was, I saw it myself, [the report] telling this pre-diabetic woman to drink skim milk instead of whole milk. Okay, so number one, the information is out of date, and number two it’s wrong, and then number three, biggest issue of all: people LIE. Okay, I think we've all noticed that lying is now a thing out there but lying was cool in health risk assessments long before it became cool in everyday life. If somebody asks you, or if somebody puts on the Health Risk Assessment: “How much do you drink” and you drink a lot, you either don't realize how much you drink and you put down less, or you do realize how much you drink and you put down less. I think we've all noticed that lying is now a thing out there but lying was cool in health risk assessments long before it became cool in everyday life. Nick: One of the things that I always found interesting when I read about Health Assessments is the concept of lying, but also the concept of maybe [the lying] is unintentional. So there's this idea called the “Hawthorne effect" that people know they're being observed, which, if you're taking an HRA that you know your employer will have access to, that you're clearly being observed, they tend to gravitate or improve scores over time. So I think the classic example with Hawthorne effect was they would treat the lighting in factories and then they saw productivity gains, but it was just everyone knew that they were watching them, so everyone was more productive. [Do you have] I think if some clean simple data that says whether it's intentional or unintentional, the data clearly doesn't match up with what we see for facts in terms of the U.S. population? Al: Yes, the drinking rate in the US population is about 70%, and the heavy drinking rate is about 10%. And yet, and I will use an example that's public information, the last company to win a Koop Award was Wellsteps. So they published all their data on what employees reported to them and only (I believe) 30 percent of employees admitted to drinking at all, and only about 2% admitted to drinking heavily. This somehow didn't bother them and it didn't bother the Koop Award Committee that they won or when they won, but obviously they might be five points lower than the average (or 10), but you're not going to be 30% versus 70%. Or, if you are, there's got to be a very clear reason to explain why this population is somehow different from every other population in the country. Smokers don’t smoke 4 days a week! They either don't smoke or they smoke every day! Nick: Looking at those three kind of major pitfalls within HRAs, let's assume we can't adjust human nature about lying intentionally or unintentionally. Is there a way in your mind to create an HRA that could be updated, that could talk about texting versus buckling your seatbelt, or could provide valuable information (not the whole milk skim milk problem), or is that something is structurally not designed or can’t be delivered appropriately within a Health Risk Assessment? Al: This is one of these ET Reese's Pieces moment here… It does happen that Quizzify has figured out a solution to this HRA issue, and the solution is simply to not ask people information that they would consider private or that they would have to lie about, but rather just determine their health literacy risk, because health literacy correlates reasonably closely with health outcomes. So maybe we don't have anything that says “Do you smoke?” but we do have questions that say things like “Which of the following chemicals are in cigarettes?” or “How many diseases can be caused by smoking?” and if people are answering those incorrectly it means that they're underestimating the risks of smoking. And, likewise with drinking, a perfect example of drinking is if you're a in that 10% of heavy drinkers you're almost certainly deficient in a number of vitamins, mostly B complex vitamins. But you're never gonna find that out on a conventional health risk assessment because you're not admitting that you drink a lot. So you're not going to get that information, which, unlike most things like quit smoking or lose weight, it's actually actionable information. You simply go out to CVS or Walgreens or Walmart and buy some B vitamins. Or, don't even start with B vitamins, just buy a little children's multivitamins, just pop in your mouth every day if you're a heavy drinker. Well so at Quizzify, we just basically say “Heavy drinkers are deficient in which of the following vitamins?” and then we give a list of a few vitamins that don't exist like vitamin G, vitamin B7, and then general B vitamins. And that way, people who are heavy drinkers will get the information that they need. Nick: And then so one thing about HRA (and the screenings, which we'll get to in a bit) is that happens once a year, one day out of 365. Does Quizzify spread those questions over a month, two months, a year? How does the actual application get delivered? Al: We do it once a month, ten questions a month. And some of our questions we only ask once, like we have a question of “what's the difference between Crest and Colgate.” Since we're on actual podcast, I want to be very specific so nobody sues me – what’s the difference between the two most popular toothpastes: Crest ProHealth and Colgate Total? And the answer is: Colgate Total contains a registered pesticide which is banned by the FDA from every other consumer product except Colgate. Now, that's a question that as an employee you only have to hear once to change your behavior. But then there are other things that every month we're reinforcing and one of the things that has to be reinforced is: there are many employees out there who are looking for ways to reduce the amount of sugar in their diet. You know, to limit the amount of sugar that they see, and they look on the ingredients labels and if the sugar is first then they won't buy it. But it turns out the company's way ahead of us on this and they have figured that there are 64 different synonyms for sugar that they use in ingredients labels. And they also figured out ways so it [the sugar] doesn't show up first or even second, but is still sprinkled throughout there so… That's the kind of thing that month after month we'll have one or two questions on to reinforce. We had somebody, just the other day, who said she took this quiz, (oh, Nicole Fallowfield of Gibson Insurance) and she said “Wait a sec!” This was a particular question about the main ingredient (or the first ingredient) of Cliff Bars, and it is organic whole-grain rice syrup. The question is: “Why is this the first ingredient of Cliff bars? Is it because – A) they’re showing their commitment to goodness, B) it's because it’s organic and it's good for your health, C) because it's whole-grain rice and it’s good for your digestion, or D) this is the most creative way to list sugar that we’ve ever seen! And of course, the answer is D. So, she said “You know, we have Cliff bars in our office all over the place” and she went back and sure enough, that's what the ingredient label said. She said that a number of people in her office are now eating considerably fewer of those things. Nick: Great! So one final question before we move to biometric screenings. You listed three compelling arguments. If you go to your blog, you'll have a list of a dozen of these. Why do HRAs remain so popular? Al: Well HRAs are one of those things… They're like pennies, baseball, communism, or Microsoft Outlook. You might say, what do those four things have in common with HRAs (or, for that matter, with one another)? The answer is: if they did not already exist, nobody would invent them! If somebody said to you: “You know, we can come up with something that you can pay a lot of money for, that your employers can invade your employees privacy and give them largely misinformation that – by the way, they're not going to take anyway, you'd say “No thank you!” But the fact is that they already exist and, well, everybody else is using them and we've been using them for a while and we want to compare our current results to past results, so you just keep on using them. Likewise with pennies! I mean, if there are no pennies and somebody came to the government and said “Why don't we invent a new coin that’s essentially worthless, that cost more than it’s worth to produce, and just gets in the way when you try to make changes,” many people would say no! But guess what, they make two billion of them every year. Well HRAs are one of those things… They're like pennies, baseball, communism, or Microsoft Outlook... If they did not already exist, nobody would invent them! Nick: So are you an optimist? Fast forward in the employee wellness industry in ten years, do you think HRA is gonna be around? Al: Not even ten years. I'm thinking in two to four years, much of what I've been noted for criticizing in wellness is going to be gone, and a lot more of wellness done for employees and a lot less wellness done to employees. There are still companies going in the other direction, going to so-called outcomes-based programs, which John Robeson(?) has referred to as “wellness or else” and I sometimes say “these programs are gonna make employees happy whether they like it or not” where if you don’t do whatever you’re supposed to do, you lose a ton of money. They're gonna be replaced with things that, frankly, you folks do and we do, where employees don't feel the slightest put upon, and some of them would actually do it even without incentives! I'm thinking in two to four years, much of what I've been noted for criticizing in wellness is going to be gone, and a lot more of wellness done for employees and a lot less wellness done to employees. Nick: Okay, great! Let's move on to biometric screening. Can just briefly, for those listening, just give us a brief overview what a biometric screening is? And similar to the HRA concept, walk us through some of these major pitfalls. Al: So biometric screening are sort of when your employer decides to play doctor, and they they bring in a screening company, and they line employees up, and they take their blood and they tell them all the things that are wrong with them. They do it every single year. Some of them stick to basics like glucose and cholesterol and they take your blood pressures, others will screen for all sorts of wacky things like thyroid and kidney and liver. And as what an actual good wellness vendor, Health Advocate, said to me when I was trying to bait them into screening me (they didn't know who I was, I wasn't misrepresenting myself) for things they weren’t supposed to screen for and they said: “Well you know, if you want to be screened for those things – meaning other than the basic: glucose, cholesterol, etc., you should talk to your doctor because what’s your employer going to do if you have low potassium anyway?” Which is a great answer! They, unfortunately, are in the minority. What’s your employer going to do if you have low potassium anyway? Nick: And then, you know I think when I think about biometric screenings and their popularity (and we'll talk about that in a bit), I think part of that is driven by the fact that employees do recognize HRAs is self-reported data and the risks associated with making conclusions or taking any kind of information from that. And so they see screenings as a way to say “Look, if we're gonna run a wellness program, at some point we want to measure whether we're getting what we want to take out of it. And what's a good way to do that? Screen everyone (or try to screen everyone) and then look at whether your population health is improving over time and things like that. So it just becomes a measure of ROI. We talked to employers for is all the time, they say that “We don't think that screenings is gonna lead to better outcomes, we just need to have that as a tool to measure. What are your thoughts about that concept, both as a tool for outcomes as we’ve talked about, but then also just a measurement tool? Al: Talking about the second one - it's a measurement tool, is actually the easier conversation because that's like saying “I want to measure how hot my oven gets by burning the roast.” Yes, you will be able to measure that your oven goes up to 600 degrees by burning the roast. But is it worth burning your roast just to show that you can burn the roast? The idea of using them to measure it's a very very expensive way to measure, and it actually turns out that it’s not a particularly effective way to measure. "Talking about [using biometric screenings as] a measurement tool ... is like saying “I want to measure how hot my oven gets by burning the roast.” Yes, you will be able to measure that your oven goes up to 600 degrees by burning the roast. But is it worth burning your roast just to show that you can burn the roast? The downside of doing too much screening... You might say “well, is there a downside other than cost?” and the answer is yes! You can get a lot of false positives, and false positives are vastly more common than anybody thinks they are. Now we're gonna have a little lesson in arithmetic – it’s only 5th grade arithmetic, but the thing about 5th grade arithmetic is how you apply it. It’s when know to apply it. So I'm gonna give you an example from false positives, and you folks sitting in your office and home can get a pencil out. Let's say you're looking for that one-in-a-thousand risk… I believe it’s one-in-a-thousand person who – not only has heart disease but doesn't know that they have heart disease AND if they found out that they were at high risk would actually change something – it's a very small percentage of people. In fact, the percentage of under 65 year old people who have a heart attack is only about one in a thousand. So one in a thousand is a pretty good number. 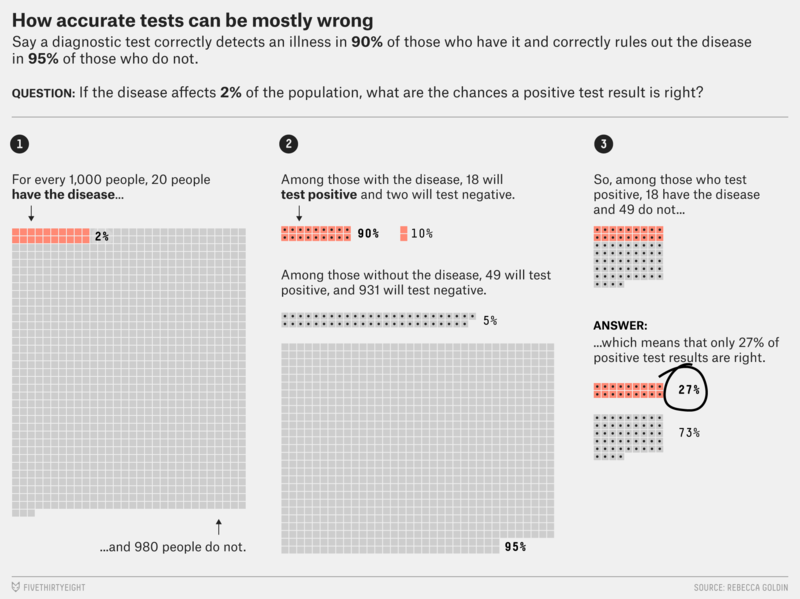 Tests are nowhere near 90% accurate for predicting. Actually, if somebody came up with a 90% accurate test for heart attack, they'd win a Nobel Prize. But let's assume a test is 90% accurate. So that means if you screen a thousand people, the test will almost certainly find that one in a thousand. BUT, 90% accurate means 10% inaccurate, which means they'll find another 99 people or 100 people who are not gonna have a heart attack, and tell them: “you're gonna go to your doctor”, and they [the false-positive people] are gonna end up with with a doctor visit, probably a stress test and possibly a stent or whatever, to find this one. So that means that of the people who test positive, you have the one who really is positive, and then you have the other 99 or 100 or who aren't positive (false positive). So, even a test that’s 90% accurate is only gonna narrow the odds of finding the right person from 1 in 1,000 to 1 in 100. Meanwhile, you've sent a whole lot more people into the doctor's office who didn't have to go. So that means that of the people who test positive, you have the one who really is positive, and then you have the other 99 or 100 or who aren't positive (false positive). So, even a test that’s 90% accurate is only gonna narrow the odds of finding the right person from 1 in 1,000 to 1 in 100. Meanwhile, you've sent a whole lot more people into the doctor's office who didn't have to go. Nick: Yeah we actually wrote a blog post a year ago or so just doing the simple math like you did – giving generous assumptions along the way and just walking that through. So it's always helpful to put a little pen and paper there. One of the things we see as well, a shift – not only major shift, but more and more groups are going to this “let’s incentivize or promote the annual physical”. And the logic there is: well, we'll get all the biometric screening data through a physician’s facts form or something like that, but then we’re helping and encouraging the employees to build a relationship with their physician prior to an adverse or kind of major event. Any thoughts on that? Al: Many thoughts on that! Okay, number one: one of the reasons that they do that is because the physician visit shows up below the line in the 85% medical claims where a wellness screen in the office which are above the line, in the 10 or 15% expense. And typically organizations spend about 85% of their effort trying to minimize the 15%, and only 15% of their effort minimize the 85%, so they can push money from the 15 into the 85. They don't care if the physician visit cost considerably more than a wellness screen. So you have this wacky sort of accounting issue going on but then the second thing is: if you actually look at the literature, the literature is unanimous, and I mean unanimous, that not only do you not benefit by going to the doctor every year when you're not sick, but actually (and leaving aside the cost) just looking at the harms, on balance you're probably more likely to get treated for something that's not wrong with you (which comes with its own set of hazards) than you are to actually benefit. So, New England Journal of Medicine, Consumer Reports, Journal of the American Medical Association, Choosing Wisely, they all say: Don't get annual physicals. Now, then the employers will come back and say: “well we want the employees to build a relationship with their primary care doctor.” If they were to actually look at the things that they spend hospitalization money for, just make a list, top to bottom, most of them have absolutely nothing to do with having a relationship with your primary care doctor. It's having babies, it's back surgeries, it's joint replacements, it’s depression and other psychotic issues, there's a fair number of cancers up there… There's almost nothing that can be prevented by having a relationship with your primary care doctor. Nick: We're gonna go back just briefly… I know you talked about the 85% - 15%, so for listeners, that's a term called the “Medical Loss Ratio.” He [Al] briefly describes what that is and how company has to spend it. Just so there's no confusion about the concept because I think a big piece of it it's driven by that counting concept, can you elaborate? Al: If you are fully insured and you do not spend enough money on medical claims, and whether or not you support the Affordable Care Act, this is one of the wackier provisions in the Act: if you [the company] don't spend enough money, you actually have to give some of it back to your beneficiaries [employees]. So, there's this this stampede to spend money at the end of the year or even during the year to make sure that you've spent enough so that you don't end up having to do a rebate [to employees]. So, there’re two great examples of this, and one we've just talked about which is the “going to the physicians when you're not sick” and the other is that weight loss programs have kind of been rebranded as “diabetes prevention programs” and now suddenly they appear below the line meaning in the 85 percent. And so, they're taking off, those programs are taking off because the employers perceive that they’re essentially free since they're not in the 15%. There's no reason to think that weight loss count as diabetes prevention is going to be any more effective than weight loss is for most people most of the time. Nick: Great! That's all the questions I had. Any other problems? I know your wealth of knowledge so I want to make sure we take advantage of having you in our office today. Any other major concept? You’re sitting there and you're in the HR seat or CFO seat at a company, you're seeing that every company out there or a lot of them are doing HRAs, they're doing biometric screenings. You have a one a few and most notable naysayers here… What’s the takeaway? Al: Well the one thing that I would say is: I used to be one of the few naysayers, and now I believe the naysayers, at least in the laymedia (probably not in the trade media) but certainly in the laymedia… the naysayers are the overwhelming majority. So you look at the Incidental Economist, New York Times, Bloomberg, Stat News, essentially anybody who covers these screening programs and HRAs is negative on them these days. So I used to be you know kind of alone in the wilderness, but my increased popularity, indicated by the fact that I'm here today and have a lot of conferences actually lined up for speaking. I think at this point just added three more now for 2018 - we're gonna have to put a list of them on our website because there's so many of them. And this was not true four years ago, I was blacklisted (I still am blacklisted by you know of some organizations) but I couldn't pay to get a speaking slot [but now the media is full of naysayers]! The other thing that that's worth talking about are these crash dieting contests that employers are having. Now why they don't have a connection to the internet is beyond me, but crash dieting is somewhere between worthless and harmful. As between worthless and harmful, nobody knows where it is. As it was described to me just today as a matter of fact by an expert on obesity who runs the ConscienHealth Blog, it's not fact, and it's not myth, it's theory that crash dieting and regaining the weight is harmful. On the other hand, it's certainly worthless. And what I would add to that, and Ted and I didn't get into this, is if in fact you're paying people to do this, it's got to be harmful because people have figured out that if you're gonna do these contests in January, so they're packing on the pounds in December. There's even a website that advises people on how to gain weight before the start of a corporate crash dieting contest. You know, you eat a lot of salt and you do stuff that I don't really want to talk about in a family forum, and then you're going and you get weighed, and then you do exactly the opposite for the next X number of weeks – that’s gotta be bad for you. And yet companies continue to do it every year. The one other thing that is very concerning and in wellness, which, has just come up recently but it's come up hugely is the impact, and until recently just essentially unpublicized, on people especially women who have eating disorders. Because they have their eating disorders under control and then suddenly they go in and you're either surrounded by all this crash dieting nonsense that makes them think that there's something is wrong with them and that's a trigger, or worse. And we have many case studies that have published recently on this. If you have certain eating disorders you're not supposed to weigh yourself, and and so they will say “Please don't weigh me.” And the person will say that on multiple occasions “no we have to weight you,” and “then please don't tell me what my weight is, I'll stand backwards” and they still get their weight announced. And they report, this is right on the website, they report triggering their eating disorder and ending up in, so far none has said the hospital, but in relapse programs that are intensive outpatient. One of them had to quit their job. So, whatever else you do, if you insist on doing crash dieting and you insist on weighing people all the time, give them a break if they report an eating disorder. They may be making it up… I mean there's some people… their dogs really aren't therapy dogs, you know, but we cut them some slack on that. Likewise, if they say they have an eating disorder, please don't make them stand on the scale. Nick: Check it out. Now, we've covered those two topics and a few others as Al has mentioned, but there're certainly more out there. And there's always new content coming out. Al: And just to end on few things: so you can look at the blog theysaidwhat.net, you can plug your own vendor into the search function. A few vendors come up showing very well. I'm obviously I wouldn't be here today if you [Wellable] didn't show up very well. In fact, actually I have to congratulate you for staying out of my blog altogether. And, there are a few show up very well but if you plug your vendor then you'll know for sure. Insist that your vendor sign the Ethical Wellness Pledge and if they're claiming savings, make them go to Validation Institute and have those savings independently validated. If they could pass those tests, more power to them. Nick: Great! Well Al you know you are never blacklisted here! You’re always welcome. Thanks for joining us today! For those of you listening, don't forget to join the conversation on Twitter. Our handle is @GetWellable. Also, we do want to hear from you, please send me an email at nick (at) wellable.co with your comments, thoughts, ideas for other episodes in future podcast, and thank you for joining.